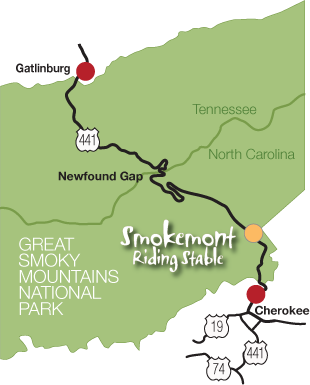 You'll find Smokemont Riding Stable in the Great Smoky Mountains National Park, five minutes north of Cherokee, North Carolina on US 441. From US 74, take exit 74. Proceed to the 4th traffic light which is a tee intersection with US 19. Turn right, go to the next traffic light and turn left. You are now on US 441 going north. Continue about 6.5 miles (about half way you wll pass the National Park Visitor Center). Look for a small sign on the right that will say Smokemont Campground and Riding Stable. Turn right across the river and then right to the stable and you're here! Great fun for the whole family! Beginner and experienced riders welcome.